iBeacon. The name speaks for itself (as does practically every other i product). With the release of iOS 7, Apple introduced a new feature in it’s API to developers. “iBeacon” allows users to receive notifications on their iDevice when they approach a location specific place and have the notification disappear when they leave. Sounds cool? Well, it could have serious applications and the possibilities are endless. Most recently, rumors pointed to Apple integrating it in their own stores. A few days later, the rumors were confirmed and Apple indeed integrated iBeacons into its stores. So what exactly are these iBeacons? Spam machines? Well, partially. I happened to test out the iBeacons when purchasing a new computer at the Apple Store yesterday (oh, and I saw the code class Apple has been promoting). First off, you have to have the Apple Store App installed. Once you have the app installed, you’ll be prompted to enable the notificatoins. 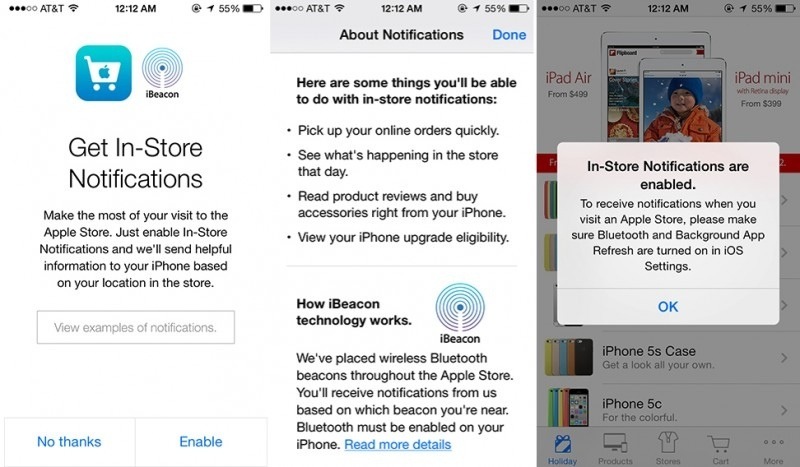 If you have in-store iBeacon notifications enabled, you’ll receive info when you walk towards a specific section. I walked towards the iPhone table and was presented with a notification (see below). Not bad, but not great. I was unimpressed with the overall usage – I didn’t get notifications for the iPad or Mac sections (not sure why). iBeacons do have potential. A lot of it, in fact. But they need to be utilized to their potential. Can’t wait to see what Apple does in the future. More pictures to come soon! Check back soon. This entry was posted in Apple, Editorial, iOS, Opinion, Tech Industry and tagged App, Apple, Apple Store, iBeacon, Mac. Bookmark the permalink.